We feel there is nothing more important than feedback from our customers in helping us grow and improve our business and welcome your comments about our natural stone products, selection and customer service. We strive to achieve your satisfaction but also want to know if can improve in any way, so, thank you - in advance - for taking the time to comment on your experience at Pacific Stonescape. I love our new basin!! I asked Steve to pick out an oblong one, and his pick was perfect. 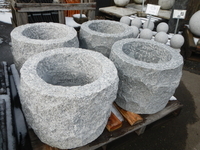 I highly recommend Pacific Stonescapes. They are very professional and a pleasure to do business with. 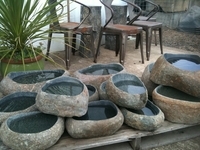 This basin is a lovely addition to any Japanese garden.